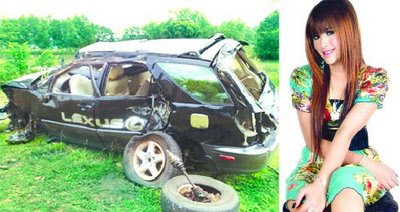 Singer Sok Pisey was hurt when her car overturned at 3:30 PM on 14 April 2008, along National Road No. 4, when she was traveling to a concert in Sihanoukville. The report indicated that Sok Pisey was driving a black Lexus car filled with 10 people, including her mother and niece. At a the road bent near the Samdech Ta village, Kampong Sila commune, Kampong Sila district, Koh Kong province, Sok Pisey was speeding and she overshot the bend to hit 5 sign poles. Her car flew off and it overturned 3 times. In the accident, Sok Pisey broke her left thigh bone and she also got black eyes. Among those traveling in her car, both her grandmothers, her mother, and her niece died in the accident, and 5 were seriously injured. Currently, Sok Pisey is hospitalized at the Calmette hospital, and her condition has improved after intensive care. Sok Pisey has regained her conscience, and she now smiles to her visitors.